Hm.. I think your question is very difficult, because answers could be wildly random: any colour could do pretty much any job, it is utterly dependent on context. You could have a pink university, and you could have a shocking yellow business. Context is everything. Then of course; how you use that pink or screaming yellow: it could work, if supporting colours and design elements are good talent cast in supporting roles. All that said, as a brainstorming on the extremely generic categories, here is a very quickly thrown-toghether thing. It would need hours of refinement, but in the case of a colour for a category, my brainstorming would start here. However, if you ask for colours that would indicate the categories, as in a list, I would make them all a little more uniform. 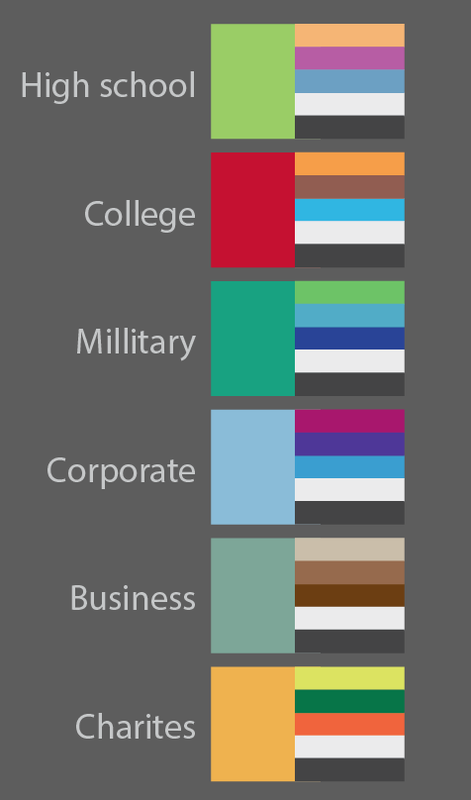 Which colors should I use to indicate higher values in a graph?